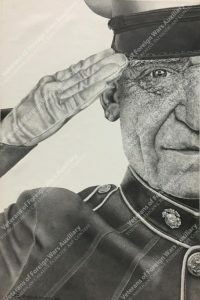 The Young American Creative Patriotic Art Contest is open to all students, including home-schooled students, in grades 9-12. Students must be a U.S. citizen or a U.S. National with a maximum age of 18 at time of local entry. No digital art or photography will be accepted, and artwork must be on canvas or paper. It will be judged on patriotic theme and technique. One winner from each Department (state) will be forwarded to VFW Auxiliary National Headquarters. View the 2017 National and Department Winners. Get the word out in your community about this wonderful scholarship contest! Visit the Scholarships section on the Program & Publicity Resources pageof the VFW Auxiliary website for a printer-friendly application, fillable media release, informational flier, helpful hints and more! We look forward to displaying winners from each Department for National judging at the 2018 National Convention in Kansas City!